Just because I love her work, and because she uses prints so well, I am posting a couple of Miriam Shapiro’s pieces. She is not a fiber artist in the same sense that we are, in that she uses fabric as a collage element and does not stitch, but she uses printed fabrics for the same effects that I use them for. There is a richness to these prints. There is an authentic “fabric-ness” that, to me, is part of the reason for using fabric and not paint or paper or elephant dung or wood chips. It is, I am sure, my own peculiarity, but I have a rule of “medium integrity” that says if you use fabric, you use it because you want the look of fabric, not in order to make fabric look like paint, or metal or anything else. I have a slight quibble, actually, with hand-dyed fabrics that mimic painted effects. Really, why not paint, if that is the look you are after? Beyond the love of pattern and print, the other delightful part of using prints, for me, is the combining of prints. It is dicey–the combination can be too, too tasteful and “decorator-ish” or, with any luck, the combination can be spicy and magical and the sum will be greater than the accumulated parts. The pictures I am posting are of some work I did several years ago. In these pieces I was cutting prints up to combine to create new patterns. The individual fabrics did not read strongly in their own pattern, but became very much part of a new pattern. I must say, that I could not live without stripes. They are so often the element that unites and/or shapes what the combined patterns become. Most recently I have simply been using prints, as June said, like paint and combining whatever feels like it works. The piece below includes a piece of African fabric (which is also used in the piece above, coincidentally), an old Liberty print as well as several quilting cottons. The side “borders” hark back to the previous pieces in that I have combined several prints to create a new pattern. In this piece you also see the outlines that I use, which June mentioned. I do think they help define and keep “crisp” the areas using prints. 1. Does anyone share my personal rule of “medium integrity” and how does it figure in your approach? 2. If you object to the use of commercial prints in your own work, why? Is it on the basis that you feel the work is not so original if it uses fabric of someone else’s design, or simply an aesthetic preference, or something else? Great discussion going on here. For myself, while I have mountains of fabric in my studio, I never thought much about whether I liked commercial vs hand dyed better; it’s all just “paint” for my work. Besides, most ofit gets so covered with buttons and beads, that very little of the original fabric shows through. The motifs are more suggstions on which to play with my love of embellishments. I do know that I don’t like the mess of hand dying, nor have I been particulatly pleased with the results until I discovered Stewart Gill paints, which have the intense colors that I’m looking for. While more work does have a “painter;y” look, I imagine that it would be compared more to pointilism due to the thousands of buttons and beads. One of the reasons I like using commercial prints is that they tend to tie me to the “roots” of fiber art–in other words, the common seamstress picking up needle and thread and stitching–because “anyone” who sews can buy the same commercial print that I have used. Wow — great conversation about the use of commercial fabrics vs dyed and painted,etc. 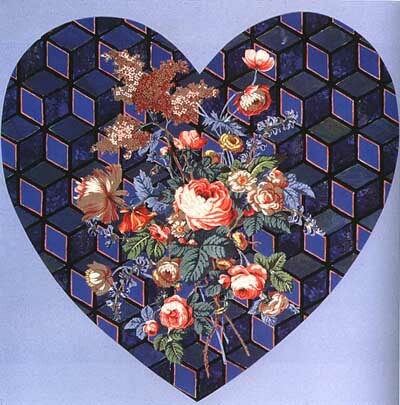 At one point in my quilting history, those commercial and vintage commercial prints actually “spoke” to me. Then one day, I kind of drifted off. I came to a fork in the road on my journey — commercial prints went one way, and I went the other. I began to want the imagery in my work to be original with me — not someone else’s imagery and design. But I have no doubt, given what fabric has always meant to me, the excitement it has generated in me, that at some future time, those paths will come together again. Only this time, somehow the essence of fabric — the tremendous almost overwhelming history of it, will once again become an integral part of my work, whether or not that means the actual use of commercial fabrics. For now, my rather large fabric collection is “resting”. I never thought of a commerical fabric as a found object but I can see that it can be thought of in some of the pieces that have jumped out to me. I use both commerical and hand dyed fabric – I don’t do painting as a picture since I can’t paint a picture that I would want anyone else to see but I do use paint on my hand dyed. The most fun I get out of the hand dyed is the process and the handling of the fabric plus the surprise of the end product. I generally use both fabrics in the same quilt or garment. Because I dye fabric I have this over sized stash and have tried not to buy commerical unless they are an outstanding color or design. Saturday, rambling . . . It occurred to me this morning that one of the appeals of Joseph Cornell’s assemblages is the familiarity of those objects, surprising in an unfamiliar context. Same thing with print fabrics used in surprising ways. When I was a child we had a depression-era quilt made by my greatgrandmother, that was a dragaround, curl up on the couch quilt. My mother used to point to the little pieces of print fabrics and say, “that was my grandmother’s apron. That was my first day of school dress, etc. etc.” I just remembered that. Maybe that’s part of my attraction to fabric prints. I mainly work abstractly and use hand dyed, hand painted, and lots of commercial fabrics, too. I just don’t think there’s any one mold that fits all of us. 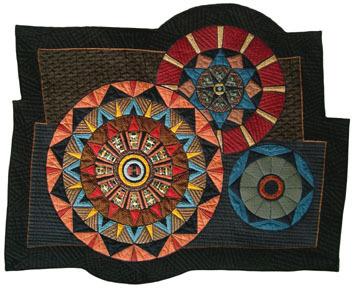 That’s one of the things I love so much about art quilts. It strikes me that some of the artists using found objects, like Kurt Schwitters and Jernigan, are making records of what can be found during a particular historic time period. I was especially struck by the comparisons between Schwitters and Jernigan — the objects they collect are very different and seem evidence left behind of a common history. This wouldn’t be as true with Pam and Terry’s textile art, of course, since there the object is not to use the found objects (the prints) as such but rather to place them into a context of their own. As Terry said, textile artists roam all around, using a 50’s check beside an African textile. Tricia hit it on the head, I’ve always though of commerical prints as found objects. It’s funny, even though I have a background in painting, I never feel much desire to paint on fabric. I guess the few experiences I’ve had were so unsuccessful that I gave up quickly. I enjoy dyeing and over-dyeing though, to me it seems more in the nature of using fabric I guess. But using ready-made fabric always seems like painting to me with a big, fast brush. As for quilting stitches, I always developing new motifs, because I use a different stitch for each section of different fabric. I work on samples to develop stitches that don’t overwhelm the original print of the fabric, but rather compliment it or make it more complex and layered in texture. I like what Tricia said about commercial prints as found objects. I come from screenprinting. I make my art in the same way as screenprinting…there is a particular shape that needs to be filled with a particular color, and I do use hand-dyed fabrics too (mine and others), but I love finding a piece of printed fabric that has either just the right blend of weird colors or shapes for the particular shape I have, or makes a statement with what is part of the print. I have probably over a thousand print fabrics (yikes, did I admit that?). I have some prints that I have used in so many quilts that I get depressed when I run out of that print. I guess it’s kind of like collage without the paper. But I really think of it as painting with bits of fabric, all different colors, like having an amazing paint set. You know how having the BIGGEST box of crayons was always the most inspirational (or the most inhibitive…is that a word? )…well, I’ve got a HUGE box of crayons. I actually get weird about using solid colors. They seem flat to me. Hand-dyed, with their variations, are much more interesting to me. But I understand using them because they don’t distract from the design. I’m just not an abstract artist…maybe THAT’S part of it? Whaddya think? Those using prints…are we less abstract? And the more abstract artists, they use the hand-dyed and solid fabrics? Interesting concept. Commercial prints as found objects. June, I think that hits the nail on the head as the way I think of commercial prints. Prints seem as found objects—they’ve been manufactured, they have connotations, they have baggage. I love that about them!!! Why don’t I use them? I’m not ready yet—but I have a box full and can’t wait until I can incorporate all that “stuff” into my own art. My digital collages explore the mix of life much more so than my fiber pieces now. The fiber pieces tend to work with fewer elements than the work destined for paper. yes, i do agree, and realized that it what i should be pursuing in my own art quilt creations. so i am chasing after the properties of fabric – cotton prints, cotton dyes, organza or cotton or tyvek i’ve painted, etc etc – I am experimenting with properties such as translucence and dimensionality. my work is starting to become as much collage as quilt. let those frayed edges all hang out. Ayyyyye, tough crowd—but I knew that going in. And I was being purposely, a bit provocative in order to elicit some discussion. First of all, to address the “you” vs. “I” distinction that Lisa brought up. I was talking about my own personal rule, that I submit is not entirely rational, and phrasing it as I hear it in my own head, ie, “if you (meaning me, myself)use fabric, etc. etc.” I wouldn’t dare to suggest that as a “rule” that applies to anyone, only as a part of my own inner dialog, and with skepticism toward that rule-making voice that creeps in. That is why I asked if anyone else shares this “rule”. Next, I don’t see printed fabric as the *only* fabric with the “fabric-ness* I was talking about, just one of the things I do like about fabric prints. Fabric, in itself, has texture, drape, and a way of taking color that is unique, and of course the stitch, which, to me, is what really distinguishes fabric art from painting. BUT–there ARE fiber pieces, and these are the ones I was talking about, that go to such extremes to mimic painting, that, for me the essence of their being fabric is all but eliminated and I do wonder why these people are not stretching canvas and painting. June, you know what (who) I am talking about and you know it isn’t you! 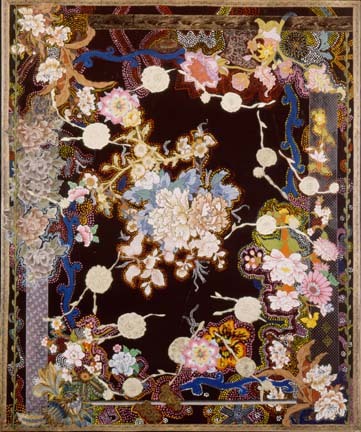 Nor is it Lisa, whose work embodies the softness, the characteristics of seam and stitch and layered pieces. For myself, parts of my recent work are painted and unstitched, or minimally stitched and it is the combination of those parts with the prints and heavily stitched sections that keep *me* from stretching canvas and painting. My point here (however poorly made) was that there are a great many ways of using fabric in art and to suggest that using commercial prints, as I do, is as legitimate, with good reasons, as any other. Pam’s explanation that “it expands my graphic vocabulary greatly” works beautifully for me. And back to Eileen, “perhaps we should be discussing how we use printed fabric vs monotone fabric?”–that was sort of my point. And, “how can we make our work look like something that a painter could not produce?”–that sounds a little like my “rule” of medium integrity. Are you saying you agree? could we discuss how the words ‘paint’ and ‘fabric’ are being used in this discussion? actually if i didn’t know better, i could easily be convinced the images were all of paintings, not textiles. after all, don’t fabric designers start with a painted design (or at least they did before it was computerized). perhaps we should be discussing how we use printed fabric vs monotone fabric? and especially, how can we make our work look like something that a painter could not produce? Thanks, Lisa, for the info about a template for multiple authors. I’m still learning about WordPress. In the meantime, I’ve put Terry’s full name on the head. Terry, I knew you would get some strong comments on your post. I was interested to hear that Pam RuBert uses commercial fabrics too. When I compare your work, Barbara’s work (in the earlier blog) and Pam’s http://pamrubert.com/, I am struck by the differences. Barbara’s seems a bit more “painterly” — (which I use as an alternative to “smooshy” when I want to sound edicated), and Pam’s seems more open, wider, less like using a #1 brush, and more like a sophisticated house paint. I’m trying to remember how Pam’s is quilted. I know that Barbara quilts closely and you quilt lightly. The printed fabrics tend to disguise the quilting (which is why they make such nice backings….) And your work and Pam’s are extremely graphic, like high end advertising — clean and clear and pointed. But I also think it’s an unconscious grammatical choice — for you, the use of commercial prints is a strong guideline and so becomes more than an IMHO — it isn’t a humble choice. We may be onto some kind of interesting grammatical structure, where a guideline isn’t just an opinion, although it’s something less than a rule. Anyway, I think your use of prints is somehow kin to the use of found objects in other art. You obviously manipulate the objects (the prints) you find, but you start with a given, an already manufactured material, and work it to make art. I think, well yes, of course I paint. On silk. On cotton. On linen. And then I bat and back. And then I stitch. Is this more false to the medium than rummaging through piles of already printed fabrics? In some ways, you are talking about being true to certain conventions of the medium. The convention of prints, which is at least a couple hundred years old. 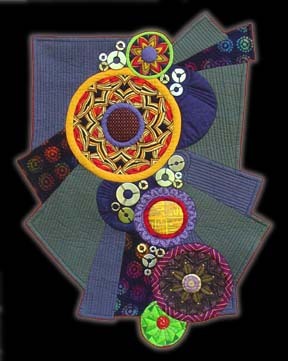 The conventions of quilt making, making new imagery by cutting up already established imagery. The convention of mixing and matching, part of what we would now call interior design (which as you note, you address and refute most as a convention). You are certainly true to a particular graphic look — a clean, outlined, flat contemporary surface. I think that I too am true to the medium, although my (current) truth doesn’t come in the bolts of prints that I can get at the fabric stores; I’m not at the moment interested in the piecing and cutting up of other imagery; and I flunked Interior Design 101 (I’m the one with no couch….). I am true to the fabric in the way that it takes the paint — silk differently than cotton differently than linen. I am true to the fabric in the way it takes stitching, in the way different fabrics and battings cause different textures. I am true to fabric in the ability to size and scale in precisely the way I want without being limited by stretchers and weight. I paint on my fabric but compared to your work, I think mine looks even less like a painted canvas. It’s the smooshy quilting and whole clothness and pursuit of the drape and feel of the fabric rectangle (even if painted) that I tend to go for. Finally, I need to add a note of thanks to everyone who has helped out getting us started here. It’s been a splendid beginning — I feel like I’m right back in the cafe, having serious cappucinos and lattes and fascinating discussions. What I like best about these discussions is that they allow me to see more clearly what _I_ do and what I am pursuing. I too, like Lisa, only use solid color fabrics in my work. I dont have the space to dye them as I would like (perhaps someday) and so have a wide selection of shades and when I need, I paint up new ones. I feel that the prints also detract from my graphic design that I work to create. Its kind of like it gets too muddy and loses its focus. There are artists who do this well (like Pam) with prints and I admire their work but for me I prefer the graphic display that solid colors allow me to have. You ask: 1. Does anyone share my personal rule of “medium integrity” and how does it figure in your approach? But in your post you state your objection to what others are doing with the use of the word “you” ie if you use fabric, you use it because you want the look of fabric, not in order to make fabric look like paint, or metal or anything else. Did you mean to use I in that sentence or were you telling us you have a rule for how others use fabric?. Back to this post – Are you asking us do we object to how others use fabric or are you asking what do we think about our personal use of fabric? Me personally – I don’t rules or stress about how others use fabric – if they do it successfully then more power to them. Me personally – I use only hand dyed solid fabrics that I dye myself. I do not like patterning in my fabric because I feel it detracts from the graphic design that I create with the piecing in my work. I want to create the lines and shapes that are seen in my work – I don’t want the fabric to dictate that for me. I also never purchase fabric for my artwork because to me the color is extremely personal and part of my artistic process. I can’t wrap my head around using someone else’s colors. I’ve tried but the result always feels wrong to me. As if my artwork isn’t truly my own. It’s a personal thing about my own artwork. I have no issues with others using fabrics created by another artist or commercial prints. While the work in this post doesn’t grab my attention, I feel Pam’s work is some of the most successful work being done today with commercial prints because she really captures the essence of the commercial fabric in her work. could we discuss how the words ‘paint’ and ‘fabric’ are being used in this discussion? actually if i didn’t know better, i could easily be convinced the images were all of paintings, not textiles. after all, don’t fabric designers start with a painted design (or at least they did before it was computerized). perhaps we should be discussing how we use printed fabric vs monotone fabric? …if you use fabric, you use it because you want the look of fabric, not in order to make fabric look like paint, or metal or anything else. I have a slight quibble, actually, with hand-dyed fabrics that mimic painted effects. Really, why not paint, if that is the look you are after? Could you please discuss some more what you mean by paint vs fabric. If I didn’t know the examples were quilts, I could be easily convinced that they were paintings. After all, many fabric designers start out by painting the fabric designs (or now doing it digitally, but anyway). perhaps we should be discussing fabric that has a print/design vs fabric that is monotone? rather than ‘fabric’ vs ‘paint’. I love fabric: it has hand, drape, texture and history. 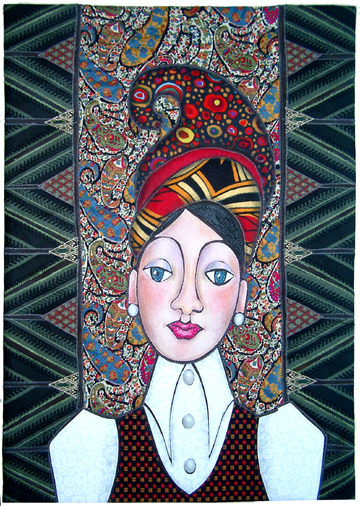 I love it painted, batiked, printed (by hand or commercially). I used both my hand created fabric and commercial fabrics in my quilts. Sometimes I use all one or the other; sometimes I combine both — for the contrast or the surprise or the metaphor: dream reality, inner or outer landscape. Fabric is material; produced individually or commercially doesn’t give it high moral ground. I use commercial prints in my art quilts because I feel it expands my graphic vocabulary greatly. Because I may use 30-50 different prints in a quilt, I wouldn’t have time, energy or know-how to create all those different prints myself. At the same time, I want control of these prints – I pick prints that are bold and graphic, yet fit well into the overall concept and design. And I try to avoid the collage-look of pasting together other artists’ symbolic language wholesale. Much of my inspiration for using commercial prints comes from studying what I call old-time scrappy quilts. I love the surprises and humor that comes from the juxtaposition of commerical prints, and I seek to evoke some of that same response in viewers of my work.